This is the stabilized version with still shots of the video originally uploaded by Josh Highcliff, "I think i saw a skunk ape - please help". 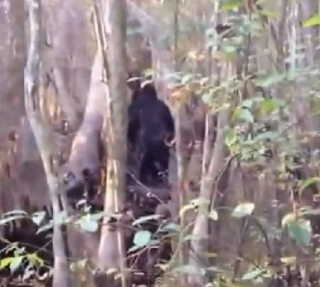 Related Post:Real Skunk Ape Sighting? I love this clip :0) Very natural behaviour from the Skunk Ape..pulling the tree apart looking for grubs. Nice 1 ! Very interesting video. Some are questioning it b/c he wasn't shaking. iPhone 5 has a video stabilizer; just tested it myself out back door and playback was not shaky or blurry.